Safari, the characteristic feature of an iOS device, enables you to have a smarter mobile life. But while enjoying using Safari on your device, you also need to form the habit of clearing Safari cookies on iPhone at regular times. - First of all, Safari cookies always saves your personal information automatically like loggin account and password. No doubt, this enables you to easily navigate to the same webpage according to the history. But, if you want to truly protect your personal information in case someone with bad ideas get access to your personal files through these Safari cookies, you need to timely clean up iPhone Safari cookies. - Also, Safari cookies will be accumulated in your device without disappearing by themselves, and its accumulation will surely take up more and more precious storage space on your device. So why do you save these useless Safari cookies which do nothing good to your device but occupy the precious storage? - After cleaning up the unwanted files and freeing up more space, your device will surely be optimized to the best. Actually, to clear Safari cookies on iPhone, you can do it within your device itself. All you need to do is go to Settings, Safari section and then hit the Clear History and Website Data option. Then the Safari cookies will be deleted from your device without any hassle. Here, you also have another choice. 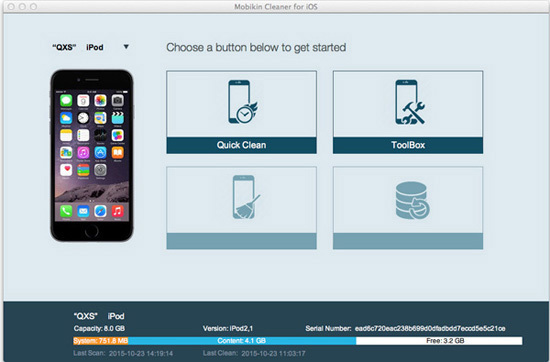 That is, using this all-in-one MobiKin Cleaner for iOS (Windows/Mac) software, which allows you to clear Safari cookies on iPhone without any hassle. Moreover, it empowers you to clear all the other unwanted junk files from your device, including Safari histories, download temp files, app caches, app cookies, user storage files and many more. This one single tool is a perfect tool for cleaning up your iPhone device and speed it up to the best. All different generations of iPhone, iPad and iPod can all be supported. So if this is what you are looking for, just download the right one and follow the below tutorial to begin the data cleaning process. First of all, open the installed software on the computer and then link your device to the computer via the USB cord. Then you will see the below interface where different modes are arranged. You can then choose the Phone Clean mode and hit the Start option to continue the process. Then, all file folders will be detected and displayed on the main interface. You can then enter the right file tab to preview more detailed file information. After that, tick out files that you want to delete and then hit the Clean option to begin the file deleting process. Finally, on the promo dialogue, remember to hit the OK option to confirm your action. And now just wait patiently for the process to get completed within a little while. 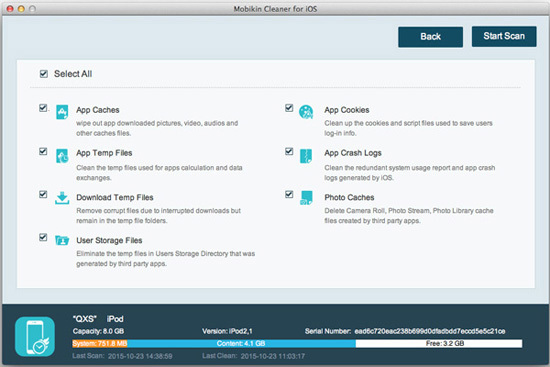 To easily clear Safari cookies on iPhone as well as other useless junk files, this all-in-one MobiKin Cleaner for iOS (Windows/Mac) software absolutely can't be missed!